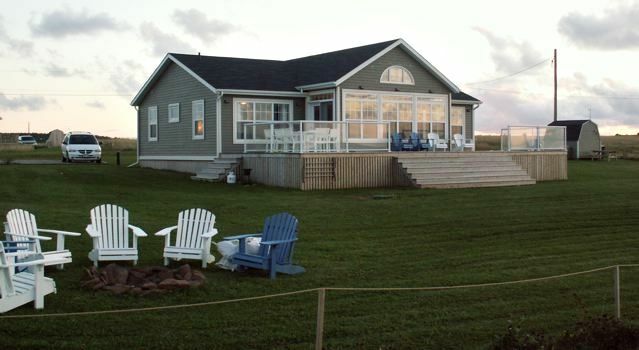 Sea’s the Moment Beach House is a stunning 4 bedroom premium beach house sitting directly above the incredible red sand shores of Prince Edward Island’s beautiful North Shore. The beach is accessed via a private path located approximately 20 yards from the cottage. Although the beach is public, it is virtually private since the public access point is about 1km away. Sea’s the Moment was designed to comfortably hold two groups of friends or families. No jamming everyone into a cramped 3 bedroom cottage! There are 2 identical master bedrooms, second bedrooms and full bathrooms arranged on either side of a large central “great room”. There are bedroom doors plus pocket doors to further sound proof the sleeping area. The great room contains a gourmet kitchen with a granite island, large dining and living room areas. The great room and both master bedrooms have spectacular views overlooking the open Atlantic ocean on the Gulf of St. Lawrence. Our spacious wrap-around deck has glass panels to provide unobstructed views of the ocean. The deck has an outdoor dining table and many chairs to relax on. We also have a large bonfire pit close to the property's edge that allows you to sit back watch the fire and listen to waves crash onto the beach after a long fun day of sightseeing, golfing or just lazing around. Sea's the Moment has a wide range of amenities, guests only need to bring clothes, food and drinks. For the beach we include a large sun umbrella, beach chairs and towels, plus a full range of sand toys. In the cottage we also have a stereo system, TV with DVD, VCR combo player, wi-fi internet access. The gourmet kitchen is fully equipped including a wine fridge. Whether you come to laze on the beach, tour Anne’s Land or relax by the open fire at night, your trip to PEI and your stay at Sea’s the Moment will become a memory you will treasure forever. Washing machine, dryer & laundry soap provided. PEI travel guides and tourist books, plus selection of trashy beach novel (take one leave one requested). Lawn area included fire pit and chairs (firewood not included). Access to cottage & deck is via 2 stairs at front entrance, balance of cottage is single floor. Beach at cottage are is not accessible to wheelchairs (cottage is on a cliff overlooking beach and is accessed via stairs. Ground level beach access is approx. 1km east. Nice house overall-stayed near end of season - inside needed a deep clean in some areas. We would have enjoyed staying longer. Will plan for future trip. I would recommend this property! We stayed at this cottage in mid October and absolutely loved it! The location was a bit out of the way, but we were happy with that and how quiet and peaceful the location was. The Island is relatively small anyway, so it wasn't too out of the way. The views from the back of the house were amazing! Each morning we walked down to the smaller private beach where you could walk in the shallow water or on the beach and enjoy the sunrise. The path to the beach is right next to the house and down some steeper wooden stairs. The inside of the house was lovely! It would be ideal for families (maybe with older kids since the cottage is located on a cliff with no real fence- had I brought my young children, I would have been nervous to let them out of my sight while outside). The rooms were light, the kitchen was nicely stocked, and while we were out exploring most of the day, it was a nice place to come home to at night. We loved our stay here and would love to come back to the island and the cottage again! Thank you! Sea View is located above a lovely beach with an unobstructed view of the ocean. The beach is accessed with steep stairs.. Nice slow increase in depth of water for swimming (and not too cold). The layout of the house works nicely for multiple families with mirror images of the bedrooms on each side of the great room and lots of beds. It is located within driving distance to local towns and Cavendish (where there are venues for entertaining kids). We enjoyed Sea View and would come again. Terrific view of the ocean, well laid out and supplied house. WIfi was fine. Local rep for the owner was very helpful. Quiet neighborhood. No problem with bugs. This is a beautiful cottage. It overlooks the North Shore and gives you a beautiful sunset each night. It is well appointed and has clean bedding. After reading the last post, I was shocked to hear of such discontent. This cottage is definitely above average. We have stayed at this cottage twice and are returning for two weeks this coming summer. There are 2 sets of bunk beds and two queens, which is perfect for 2 families, if necessary. The cottage is well stocked with all of the amenities you could ask for. Full kitchen with kids plates and cups, beach towels, laundry, sheets and blankets. It has a beautifully big front porch to look out onto the ocean. The climb down to the beach is steep. It has an old set of stairs, which is actually more that in a lot of places on that side of the Island. If you take your time, they are easily done. We have had our young family of kids aged 1, 3 &4 go down the stairs. The shed has beach toys and stuff for the kids to play with. There was no cable tv when we went and internet was spotty because of where the cottage is located. That wasn't a big deal for us as we were on vacation and just wanted to disconnect. You aren't that close to a grocery story ( about 25 minutes away) so make sure you stock up on food, drinks, etc. before settling in. We ran out of propane once and the caretaker came right away with a new one- but you'll have to get the rest yourself! We loved this cottage and when we went back and it was booked, we were really disappointed. This is a great cottage for a big family or 2 families. We rented this house for a week holiday. I must start by saying the cleaning staff was awesome & view was spectacular, but that's where the positive reviews end. Phones were dead = internet was dead = members in our travel party had to pay at a local restaurant daily to work online. Luckily we had cell phones just in case... although signal was very spotty at best. Ran out of tp & waited a day for refills (a house of 11 people sharing half a roll...imagine) No A/C which I didn't realize at booking. For a luxury home, not luxurious; esp with heat index of +30. Ceiling fans in 2 of 4 bedrooms, so 2 bedrooms roast. Spider infested home (big spiders inside & out). Broken railing on deck. Told it would be fixed on day 1... never repaired. No handicapped accessible features, makes hard for elderly/handicapped to enjoy. Beach access beside house but must walk down incredibly steep staircase to beach-- difficult for any age/shape to climb up or down. To top off our stay, on our final night, the house was infested with beetles. ..flying kind... thousands. .. Now in owners defense a hurricane was approaching. .. however it was the lack of response that bothered us... We had to duct tape doors to keep bugs out& close windows. ..With no A/C this made our last night there terrible. Amenities that were given were nice: towels, sheets, appliances. But definitely would not pay this price ever again & wouldn't call this home "luxury". We notified property management & owners & received an apology, but that's it. Highly disappointed. VRBO posted rate includes all taxes, fees and charges.